This is the larger of several campgrounds (USACE) around Allatoona Lake. Sites are well spaced and private. Water & Electric. A walk around the campground is relaxing and pretty, especially in the fall. We do not recommend sites 31, 32, 33 for motor coaches even though they are pull-thru! These 3 are on a hill and hard to get into and out of. Asphalt, but older sites and seriously need to be repaved. We had to back down and use the access road instead of pulling forward to exit due to the steep downgrade. We camped at McKinney Campground COE in a Motorhome. Use Route 75 to exit 278. Large campground. Friendly staff at check in. Shady. Some sites looked a little tricky to get into. Some beautiful waterfront sites. Several pull throughs. Our site was on an incline but long enough we could get level. Our site was a large and shady pull through. Had deer walk through in the morning. Bathroom/shower was a walk up an incline. Paved roads throughout for nice walks. No camp store. We were there over a weekend that was a local school break so it was FULL. It was quiet and private. Dollar General within 5 miles. We camped at McKinney Campground COE in a Travel Trailer. Agree with all the previous posters except find locking the entrance gate to returning campers at 10:30 PM antiquated. We attended a Braves baseball game and since we returned after that appointed hour we had to park our truck outside and walk just under a mile in the dark I might add to our RV. I suggest issuing a gate code to re enter the park after hours. We camped at McKinney Campground COE in a Fifth Wheel. We stayed for one night and wished we could have stayed more! We were in campsite #80. If you can get #82 or 98 they have a great view of the lake. Lots are spacious and offer some shade. Site surface is asphalt and features a fire ring and picnic table. We camped at McKinney Campground COE in a Motorhome. This is a very nice campground with privacy between the rather spacious sites. I really didn't see any really bad sites. On the weekend the lake get noisy and busy with PWCs and boats. The roads and site pads are paved, with pea rock at each campsite which really helps with keeping the camp area clean from dirt and mud if it rains. The bath houses are small, but clean. TV stations are plenty coming out of Atlanta, but could not get the Satellite Dish to pick up a signal due to the tree cover. I really didn't see any really bad sites. Park staff can be a bit rude and very strict in rule enforcement. Deer were seen in and around the campground. Boat/ pontoon rental is available within 5 miles at one of the marinas in the area. We camped at McKinney Campground COE in a Travel Trailer. As is typical with many COE parks - the setting was heavily wooded and beautiful. Reportedly there are 7 million visitors a year to this park - it is easy to see why. It is quite large and spread out over a big area. It is heavily wooded so satellite signals are not likely to get thru. There area few OTA stations available. We camped at McKinney Campground COE in a Motorhome. We love to come to McKinney Campground. We have been going there for 27 years. My husband caught 59 crappie, a 4ft. gar, and good size catfish. Pretty productive fishing trip. However, this past time the restroom at the top of the hill above sites 86-91 were pretty disgusting. The main restroom in that area was pretty clean. Just beware there is one female attendant at the gate that can be pretty darn rude. We camped at McKinney Campground COE in a Fifth Wheel. Great park with beautiful views of Lake Allatoona. We were in 126 which had good access to the bathhouse but was on a loop off the main road. Beautiful Autumn foliage and lots of deer and turkeys. We will be back in the summer! We camped at McKinney Campground COE in a Travel Trailer. Great COE park near Atlanta. The campground is great and sites are spread out. 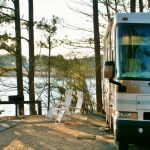 We loved our site which had a great view of Lake Allatoona. OTA tv was good with about 16 channels and Verizon was great. Utilities worked well. Only a couple of negatives one is the tight maneuvering requrired in certain areas. The other is not the campgrounds fault just the occasional train and road noise. You can get an interior site which buffers the noise. We would stay here again. We camped at McKinney Campground COE in a Travel Trailer. We arrived on Friday without reservations and found there were many sites available but size limitations were a concern. We were assigned site 106 and there was plenty room. Most sites we observed are large with other sites a good distance away. A great park with paved and graveled sites with interior paved roads big rig friendly. Good utilities but the dump station is on a slope with dumps in a row. This time of year the leaves cover the site which gives it a dirty appearance. Overall, great park. We camped at McKinney Campground COE in a Motorhome. 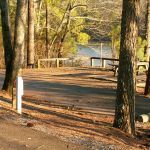 This park has 150 sites which are situated within the hilly areas on one side of Allatoona Lake. Loops are separated by gorges or inlets of the lake. This gives the campground a more "rustic" and primitive feel than many other COE parks. Undergrowth is left uncleared between many sites (this is a good thing for the lovers of a more natural experience). The sites are laid out well and generally well maintained. This is an older park, so some of the sites are a little small or short for a large camper; however, there are plenty of adequate size sites available. Check before you go. We originally booked a pull-through site at the end of a loop. That site, #98, while it looked good on the map, was on too short of a turn for a 34' fifth wheel. Easy change. Looking around the campground, some of my favorite sites for our next visit are 43 - 47, 34, 24&25. There are probably many others that are as good. There are many many deer as well as the usual population of ducks, squirrel and other critters in the park. Bath houses are basic, functional and relatively clean. There is a laundromat in at least one. Nice beach, playgrounds. Full Verizon cell service. This CG is in the coverage area for all Atlanta TV stations. Satellite reception depends on the site - probably 60% availability. There are two dump stations near the exit in cascade. The first one is the more level of the two. There is a nozzle on the dump station hose, but NOT a water connection for a black tank flush. They really need to add this, or at least a female hose bib connector on the end of the cleanout hose for this purpose. My only other negative comment is they have those confounded concrete picnic tables that are found in many of the older COE parks. These are impossible use. There is a train trestle, a couple of miles away, across part of the lake which is visible from much of the CG. There is heavy train traffic across the trestle. The trains are audible but not loud enough to be bothersome. We camped at McKinney Campground COE in a Fifth Wheel. This was our first time staying at McKenney. Nice Place. The loop we were on was very quiet and calming. Waterfront site on a small lagoon. Really like it here. The site was level, short runs to hookups. The site had a deck overlooking the lagoon and from the site you could walk down to the water. We've already booked again. We camped at McKinney Campground COE in a Travel Trailer. This is a beautiful shaded campground with plenty of trees and privacy. Sites are large, each site has a pea graveled area with table, fire ring, grill, and lantern post. Our first night was lakefront #89, a back-in. It is across from a marina, so there is boat traffic. Our other site #98 was also lakefront, a pull-through site. Boat traffic was frequent. There were lots of boats, so I think you should expect this if you stay during the summer and choose a lakefront site. The swimming area and beach were very nice. Sand extends all the way to the roped of area and gradually slopes like a swimming pool. All of us loved the swimming area. There is also a nice playground geared more for toddlers to age 8. There is parking at the bath house/restroom. The one closest to us, was a shower toilet combo, and only has 2 units. One thing I loved in the shower, was a small shower underneath the adult spout. You turned a lever and it would switch from the top to the lower, which is wonderful if you have small children to wash. It made bath time a lot easier for me because there was not soapy water getting in their eyes. The roads are nicely paved and are excellent for bike riding. Gates do lock at 10:30 pm. We have a large family so using the shower in the RV fills our tanks quickly even when used in moderation. There are no sewer hookups at any of the sites. This was the one and only complaint because you have to drive to the dump station. It is by the front gate and accommodates 2 at a time. There is also laundry facilities. We loved it here, and it is our favorite so far. We camped at McKinney Campground COE in a Motorhome.